The electronic transfer of data between computers is no longer an option; it’s a necessity. Today’s global enterprise demands rapid information that is easy to obtain. Collecting and recording data with SMARTer Manager’s barcode inventory control software increases accuracy, translating to considerable time saved by knowing exact materials location. 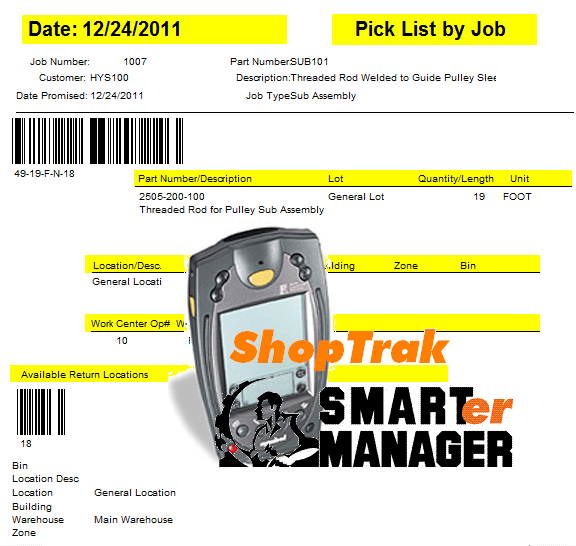 By implementing a powerful barcode inventory control system, you can quickly achieve measurable improvements with ShopTrak Inventory Control Software. SMARTer Manager combines sophisticated inventory barcode data collection with hand held Computing technology, continuing the revolution of data capture. With integrated barcode scanning devices, sophisticated connectivity, and ruggedness to a full-featured ERP application, SMARTer Manager maximizes your software dollar. Using the barcode scanning ability at the point of activity, SMARTer Manager captures vital data, critical to inventory management. With an easy-to-use bar code scanning tool, SMARTer Manager users can go anywhere at any time to capture and communicate information while increasing productivity. Users are able to scan materials to production, return unused inventory back to stock and enter data quickly and effortlessly. This exceptional barcode ability also empowers manufacturing personnel to incrementally issue and monitor materials,keeping product inventories as low as possible to avoid unnecessary costs. Much faster than writing information by hand, and much more legible. When more data is collected, tracking and inventory locations can be more discrete. This means you improve utilization of people and equipment. Additional production is possible. Product waste occurs when similar but incorrect components or raw materials are used. With 100 % accurate location of raw materials or WIP using barcode scanning, scrapped product can be eliminated. SMARTer Manager hand held terminals allow users to ask questions on the floor, collect data remotely, decrease walk time and eliminate trips to the office. Bar coding is information accuracy. SMARTer Manager barcode data collection reduces material fulfillment time and increases production accuracy. Not only does this reduce costs, it increases customer satisfaction and sales in the long term. SMARTer Manager is the first ERP software in the world to offer advance technology in barcode scanning functionality with hand held computers. SMARTer Manager combines this sophisticated barcode scanning technology with Motorola Technologies’ Palm Terminal. It’s ruggedized housing withstands drops of up to 4 feet and capable of withstanding elements like rain and dust. Using the SMARTer Manager SmartSync client, the inventory data collected on the production floor is exported to the SMARTer Manager database for review and validation. Time that used to be spent verifying information or tracking down problems is eliminated, making SMARTer Manager hand held terminals very easy to use and highly accurate.